The Arabian Nights Dinner Show in Kissmmee, Florida will be closing. Their final performance will be given on New Years Eve. 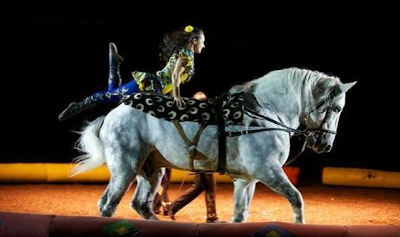 The long-time Florida tradition, Arabian Nights will be closing forever citing a downturn in sales and demand for lower ticket prices which hinder the quality of the show, states owner Mark Miller. Miller also states that the group sales to resort and ticket brokers are down as they also are demanding a lower, more discounted price. Rather than offering an inferior and shoddy product on the shoe-string budget these sales would allow, Miller made the tough call to close the show's doors forever. The show which is set in a horseshoe shaped area has given over 10,000 performances of it's romantic story of two Bedouin tribes uniting in marriage. After 25 years it's going to be hard to look at the Kissimmee tourist area the same way with Arabian Nights gone. It will join a long line of extinct dinner shows lingering in Florida history. Miller understands the impact this will have to Central Florida residents so Arabian Nights is offering 50% off tickets for residents to visit the show one last time though the end of the year. After the show closes the 40 amazingly trained horses will be moving to an 80 acre farm, Miller's family has been breeding and caring for both Arabian horses and other breeds for ages. So no fear of anything regarding the animal care after the end of the show. Sadly the same can't be said for the 224 employees who will also be loosing their jobs- from animal staff to servers. Miller also stated that he will likely sell the land around the building as well as the building but for now, a small staff will stay on to keep the building standing and secure. From the article it seems unlikely the show will ever return. While I deplore the loss of jobs and a Florida Staple, I also have to commend Mark Miller for his standards. Rather than offer a cheap and watered-down product just to sell tickets, one that won't live up to the history and standards of the show.. it will close. We're all rather sad to see the end of yet another Florida tradition. While I've seen the show several times in my past, I can't say the food was amazing but you didn't go for the food. You went to watch the story, told to you through horses and performers. Food and Drink simply became an after thought, an automatic action while you stared in amazement at the astounding acrobatics and beauty happening before you. If your in Central Florida, Visit Arabian Nights before it disappears. You can purchase tickets either over the phone or through their ticket office. Please note you WILL need a Florida ID to get the 'Half-Price' ticket.